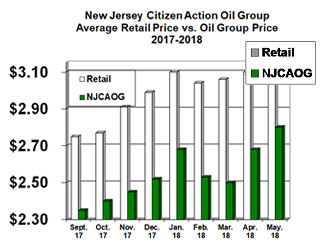 New Jersey Citizen Action Oil Group (NJCAOG) is comprised of thousands of New Jersey heating oil consumers who have joined together to say "NO" to high priced heating oil. Members realize that by joining the Oil Group they are able to save money per gallon and not sacrifice the quality and dependability of a full-service oil company. The Oil Group was formed in 1983, when NJ Citizen Action's work on state utility issues showed that we could organize consumers and keep costs down. Our Mission Statement: To use collective bargaining power to negotiate discounted prices on heating oil and act as an information resource and advocate for New Jersey heating oil consumers. Individual households, businesses, churches and apartment owners can rely on low rates without having to shop around every time they need their tanks filled. The Oil Group serves every New Jersey county with the exceptions of Cape May, some parts of Atlantic, Salem, and Cumberland counties. As an agent for thousands of members, the Oil Group uses its bulk purchasing power to negotiate the best possible price with local dealers. After joining, members are assigned a supplier, and then they simply call the supplier and make arrangement for fuel delivery but at the Oil Group's special price. Members are guaranteed a fixed mark-up above wholesale prices for their heating oil purchases. The prices members receive are less than average retail prices. Some Oil Group suppliers provide service contracts and tank insurance at a discounted rate too. To donate to the NJCA Oil Group, please click here.